Western blot analysis of extracts from LNCaP and SNB-19 cells, and mouse brain, untreated (-) or treated with λ phosphatase (+), using Phospho-CaMKK2 (Ser495) Antibody (upper), CaMKK2 (D8D4D) Rabbit mAb #16810 (middle), and β-Actin (D6A8) Rabbit mAb #8457 (lower). Phospho-CaMKK2 (Ser495) Antibody recognizes endogenous levels of CaMKK2 protein only when phosphorylated at Ser495. Bands of unknown origin are observed at 42 kDa and 25 kDa. Polyclonal antibodies are produced by immunizing animals with a synthetic phosphopeptide corresponding to residues surrounding Ser495 of human CaMKK2 protein. Antibodies are purified by protein A and peptide affinity chromatography. 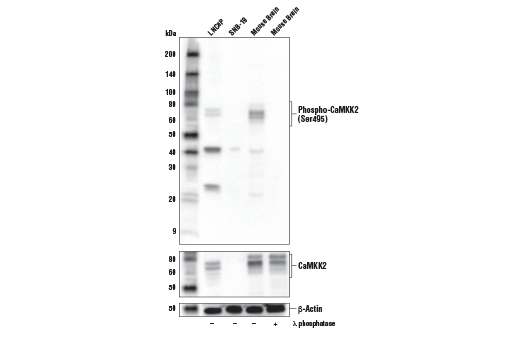 Calcium/Calmodulin-dependent Protein Kinase Kinase 2 (CaMKK2) is a member of the CaMK family that contains a central Ser/Thr kinase domain followed by a regulatory domain consisting of overlapping autoinhibitory and CaM-binding regions (1). CaMKK2 can be distinguished from other CaMK family members by the presence of a unique Pro/Arg/Gly-rich insert following the ATP-binding domain (2). CaMKK2 phosphorylates CaMKI at Thr177 and CaMKIV at Thr200 (3). CaMKK2 also phosphorylates AMPKα in response to calcium (4). CaMKK2 has been implicated in long-term memory formation (5) and adipocyte development (6). CaMKK2 is phosphorylated at Ser511 by death-associated protein kinase (DAPK) in a signaling cascade thought to be involved in neuronal death (7). Multiple CaMKK2 phosphorylation sites have been identified, including Ser495, and C-terminal phosphorylation of the CaMKK2 autoinhibitory region may regulate its function and localization (8). Tokumitsu, H. et al. (1997) Biochemistry 36, 12823-7. Tokumitsu, H. et al. (1995) J Biol Chem 270, 19320-4. Anderson, K.A. et al. (1998) J Biol Chem 273, 31880-9. Hawley, S.A. et al. (2005) Cell Metab 2, 9-19. Peters, M. et al. (2003) J Neurosci 23, 9752-60. Lin, F. et al. (2011) Endocrinology 152, 3668-79. Schumacher, A.M. et al. (2004) Biochemistry 43, 8116-24. Nakanishi, A. et al. (2017) J Biol Chem 292, 19804-13.